Jo graduated from Birmingham polytechnic in 1978, with a BA Hons in fashion/textlies specialising in weaving. 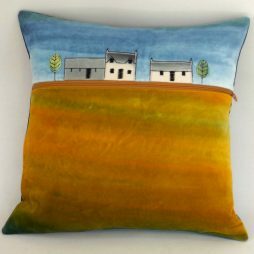 In 1987 she set up a workshop in Balnakeil Craft Village in Sutherland designing, making and selling cushions and wall-hangings. In 1992 she relocated to Kirkcudbright in SW Scotland and recently relocated again, just 15 miles out into the the beautiful Galloway countryside. 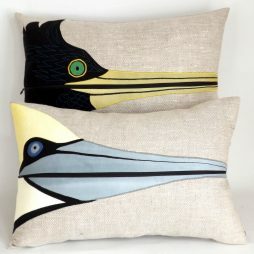 Jo’s work is inspired by the surrounding countryside, its colours textures and shifting light on hills and coast, while a lot of her cushions take a quirky look at its flora and fauna. Jo has done workshops and projects with adults and in schools, including an artist’s residency in secondary schools and will give illustrated talks to groups. 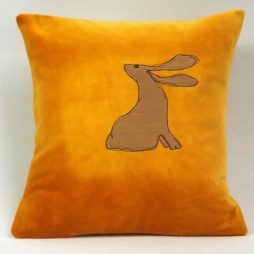 The fabrics she uses are mostly cotton, linen and silk, in a wide variety of textures and weights from fine transparent silk organzas, to rich cotton velvets. 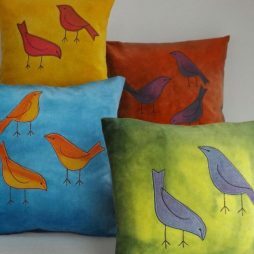 Most of these she dyes herself using Procion dyes, painting the dye onto the wet fabric giving an effect similar to a watercolour wash.